At the Treaty with the Indians at Fort Stanwix in 1784 the United States forced the Iroquois to cede all claims in New York, Pennsylvania and in the Northwest Territories for $5,000. Neither the Delawares, who occupied Pennsylvania, nor any western tribes were present, and a second Treaty at Fort McIntosh was held in January, 1785 to establish the first boundary in the Northwest and to gain clear title to Delaware lands in Pennsylvania for the Commonwealth.  Pennsylvania needed a clear title so that its Revolutionary soldiers could purchase these lands with certificates of depreciation, equivalent to the drop in purchasing power of their compensation. Reserved from these Depreciation Lands was a 3,200 acre plot at the mouth of the Beaver. The United States Commissioners were General Richard Butler, who led Pennsylvania Continentals at Saratoga, Stony Point and Yorktown; Arthur Lee, one of the commissioners who negotiated the French Alliance; and Col. George Rogers Clark, the hero of Vincennes. The terms were imposed rather than negotiated, the Delawares, Wyandots, Chippewas, and Ottawas were told that France had renounced all claims, Britain had not stipulated anything in their favor, and, since they had taken sides against the United States, they were to come under its protection. 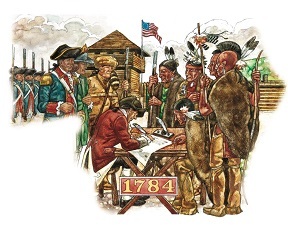 The basic articles of the treaty provided for hostages until all captives had been returned, for the acknowledgement by the Indians that they were under the protection of the United States, and that the United States would take over the border forts, Detroit and Niagara. Article III was the most important, for in it the Indians ceded all claims to two thirds of Ohio. The fact that other nations occupied this country but were not at the treaty was ignored. In May, 1785 congress passed the Land Ordinance of 1785 providing for the sale of pre-surveyed public lands, and in September surveyors based at Fort McIntosh and guarded by its troops began running the Seven Ranges in Ohio. A National Parks monument now marks this base point from which all future states and territories were measured. The Pennsylvania Commissioners then gained title from the Indians to all of Northwestern Pennsylvania, in exchange for $2,000 in trade goods. Articles of a treaty concluded at: Fort McIntosh, the twenty-first day of January, one thousand seven hundred and eighty-five, between the commissioners’s plenipotentiary of the United States of America, of the one part, and the sachems and warriors of the Wyandot, Delaware, Chippewa, and Ottawa nations, of the other. ART. 1. Three chiefs, one from among the Wyandot, and two from among the Delaware nations, shall be delivered up to the commissioners of the United States, to be by them retained till all the prisoners, white and black, taken by the said Indians, or any of them, shall be restored. ART. 2. The said Indian nations do acknowledge themselves and all their tribes to be under the protection of the United States, and of no other sovereign whatsoever. ART. 3. The boundary line between the United States and the Wyandot and Delaware nations, shall begin at the mouth of the river Cayahoga, and run thence up the said river to the portage between that and the Tuscarawas branch of Muskingum; then down the said branch to the forks at the crossing place above Fort Lawrence; then westerly to the portage of the Big Miami, which runs into the Ohio, at the mouth of which branch the fort stood which was taken by the French in one thousand seven hundred and fifty-two; then along tile said portage to the Great Miami or Orne river, and down the southeast side of the same to its mouth; thence along the south shore of Lake Erie, to the mouth of Cayahoga, where it began. ART. 4. The United States allot all the lands contained within the said lines to the Wyandot and Delaware nations, to live and to hunt on, and to such of the Ottawa nation as now live thereon; saving and reserving for the establishment of trading posts, six miles square at the mouth of Miami or Orne river, and the same at the portage on that branch of the Big Miami which runs into the Ohio, and the same on the Lake of Sandusky where the fort formerly-stood, and also two miles square on each side of the lower rapids of Sandusky river, which posts and the lands annexed to them, shall be to the use and under the government of the United States. ART. 5. 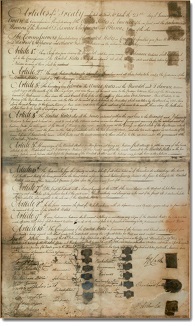 If any citizen of the United States, or other person not being an Indian, shall attempt to settle on any of the lands allotted to the Wyandot and Delaware nations in this treaty, except on the lands reserved to the United States in the preceding article, such person shall forfeit the protection of the United States, and the Indians may punish him as they please. ART. 6. The Indians who sign this treaty, as well in behalf of all their tribes as of themselves, do acknowledge the lands east, south, and west, of the lines described in the third article, so far as the said Indians formerly claimed the same, to belong to the United States; and none of their tribes shall presume to settle upon the same, or any part of it. ART. 7. The post of Detroit, with a district beginning at the mouth of the river Rosine, on the west end of Lake Erie, and running west six miles up the southern bank of the said river, thence northerly and always six miles west of the strait, till it strikes the lake St. Clair, shall be also reserved to the sole use of the United States. ART. 8. In the same manner, the post of Michilimackinac, with its dependencies, and twelve miles square about the same, shall be reserved to the use of the United States. ART. 9. If any Indian OF Indians shall commit a robbery or murder on any citizen of the United States, the tribe to which such offenders may belong, shall be bound to deliver them up at the nearest post, to be punished according to the ordinances of the United States. ART. 10. The commissioners of the United States, in pursuance of the humane and literal views of Congress, upon this treaty’s being signed, will direct goods to be distributed among the different tribes for their use and comfort. It is agreed that the Delaware chiefs, Kelelamand, or Colonel Henry, Hengue Pushees, or the Big Cat, Wicocalind, or Captain White Eyes, who took up the hatchet for the United States, and their families, shall be received into the Delaware nation, in the same situation and rank as before the war, and enjoy their due portions of the lands given to the Wyandot and Delaware nations in this treaty, as fully as if they had not taken part with America, or as any other person or persons in the said nations. Sam’l J. Atlee, Pa. Com’r. Jos. Harmar, Lt. Col. Com’t.